FO Friday: A Lonely Tree Ta-dah! After checking, double-checking, and triple-checking, I'm sure this was made exactly to the pattern (minus the odd little error, but let's just ignore those) and nothing is missing so I needn't have worried about the yarn - in the end it took *just* under 1 skein which means I have almost half a skein left over despite using slightly larger needles. I love the FO and what's more it goes with my red clogs! 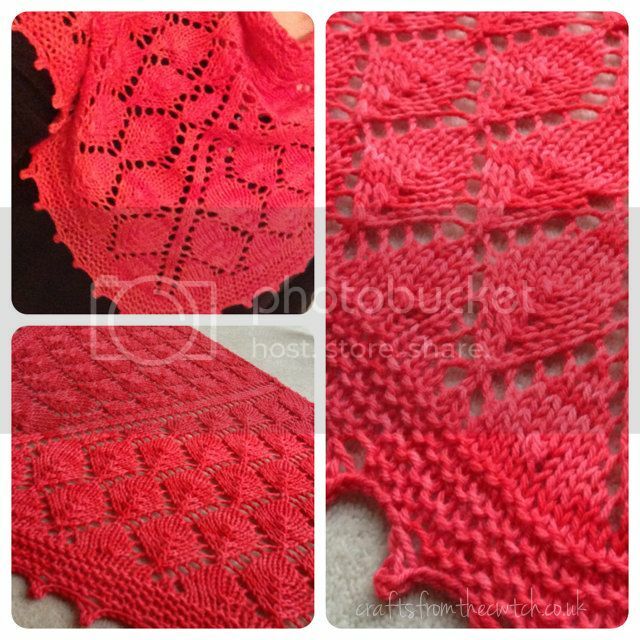 If you're thinking you couldn't knit a chart or haven't tried a lacy project before (I know some of you are after various Facebook and Instagram comments), this free pattern could be just right for you. There is nothing complicated, the charts are clear and the thick yarn/big needles mean it's finished in no time. I've spotted the bigger bulky version - The Lonely Winter Tree so that's been added to my queue. For fear of leaf overload I think I'll wait a while before making it. I'll be back on Sunday with my Year of Projects update. See you then. Beautiful work as always Sarah. That will look stunning on you! That's gorgeous, and has gone straight in my queue :) The yarn looks perfect for it - so bright and cheerful! Lovely! And I love the colour. That is beautiful! And the colour is just right for wrapping up on a chilly day. Beautiful! And the colour is stunning. The colour is really awesome, a great knit! I love it...well done!! But what would be Bulky Yarn be?? Pinned it! Too gorgeous! Thanks for sharing.